The glories of nature will be celebrated at a very special ‘Seeing Into the Life of Things’ Nature Weekend at Dove Cottage in Grasmere, The Lake District, on September 20 and 21, as families and other visitors are invited to get involved with a wide range of activities inspired by the current exhibition Wordsworth and Basho: Walking Poets. The weekend will offer something for everyone, from the hands-on to the highbrow. There are activities for adults and children. These are timed so that parents can participate in an adult talk, reading or workshop, while their children enjoy craft and creative activities. Grown-ups are welcome to join in with their kids and have some fun. Saturday’s schedule has workshops on animal origami, Japanese calligraphy and have-a-go haiku writing with poet Kim Moore. There is also a ‘Let Nature be Your Teacher’ guided walk, looking at the animals, places and views that inspired Wordsworth. On Sunday September 21, young people can make seed bombs, craft a ‘Journey Journal’ and take part in a photography workshop that features both top tips and a walk around Dove Cottage. Small charges ranging from £1-£3 apply to young people’s workshops. Central to the weekend is a visit from ornithologist, Mark Cocker, author of Birds and People and most recently Field Notes from a Small Planet. On Saturday September 20 (11.45-1.15pm) Mark will lead a lunchtime walk in the area around Dove Cottage, encouraging participants to take a 360 degree look at the world around – plants, insects, birds, landscape and management. (£5 pp). In the evening, he will read from his books and discuss his two most recent events (£7). Adults can listen to talks and readings, as well as getting involved in workshops. On Saturday September 20, poet Ken Cockburn will be explaining how he and Alec Finlay used the poet Basho’s work Narrow Road to the Deep North as the inspiration for a walk around Scotland. He will also read from a long poem they then wrote as a result of this experience (£5 in advance; £7 on the day). Ken will also be leading a workshop in the landscape around Grasmere, which will create a Japanese Renga, or ‘verse chain.’ Booking for this session is essential and costs £15. Also on that day Professor of Literature, David Higgins, will explore the influence that John Clare has had on contemporary nature writers (£5). Poet Katrina Porteous will be speaking on Sunday September 21 and will explain how poets listen to the landscape (£8), and leading ecologist, Timothy Morton, will look at why we need art in a time of ecological crisis (£5). Those wishing to gain enlightening insights into the Wordsworth and Basho: Walking Poets exhibition can join guest curator, Mike Collier for a guided tour of the exhibition, which features original and facsimile manuscripts from Wordsworth and Basho and fantastic pieces of contemporary art by 17 UK and Japanese artists who have responded to the poets’ words. 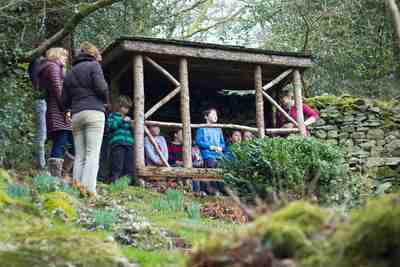 All events can be viewed at wordsworth.org.uk.